Again was a little late in cartingout and took Aqua coz it was one of the remaining colours available. 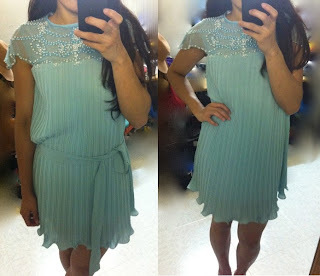 I think it's a blessing in disguise because the dress is lovely in real life :) Including the embroidery work. I could use this to very formal dinner events I have to attend in future. Cut is romantic. comes with lining and workmanship is superb. Well done Smooch! Only disadvantage to this design is that it works al taller girls as the flare will make you look stumpy if it's too long.I prefer it without the sash!